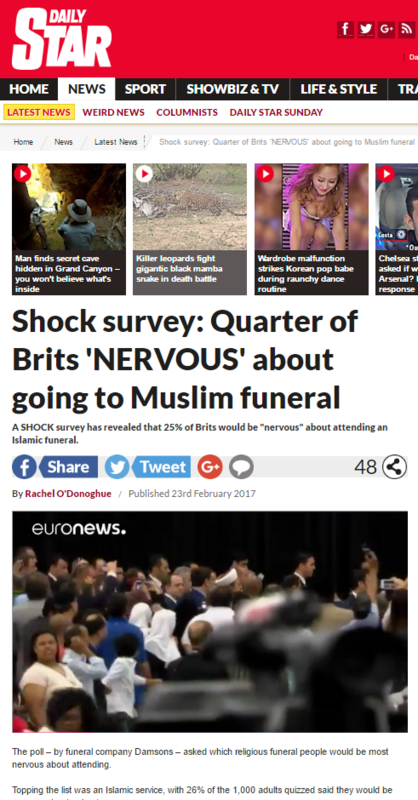 A SHOCK survey has revealed that 25% of Brits would be “nervous” about attending an Islamic funeral. While it would have been easy to guess that funerals were unlikely to be the most enjoyable experience for the average person, it’s notable perhaps that of all funeral types, it’s the ones associated with the Islamic faith that make people the most ‘nervous’, with an apparent quarter of people admitting they’d be nervous about attending one. Topping the list was an Islamic service, with 26% of the 1,000 adults quizzed said they would be nervous about going to one. It was closely followed by 25% who said the same about a Christian one. That’s right, Christian funerals fared almost identically to their Islamic counterparts – yet the Daily Star (or the PR company that fed them this story) chose to emphasise the Islamic finding, presumably figuring it would garner more attention. The poll – by funeral company Damsons – asked which religious funeral people would be most nervous about attending. This is literally nothing more than a funeral company telling prospective clients: “we know funerals can be hard, but it’s OK, we’re a safe pair of hands regardless of your faith”. And perhaps it’s achieved its goal, in that respect, but at what cost? With the needless singling out of the result for Islamic funerals, which was almost identical to Christian funerals (by far the most common funeral service in the UK), Damsons have generated a headline which will be skimmed over by readers of a newspaper with an established record of Islamophobia, the vast majority of whom will never spot that there was no difference between Christian and Islamic results, and will never realise that this is nothing more than an advert. At a time of political and racial tensions, the PR industry simply has to be more responsible and ethical than this: their work does not exist in a vacuum; hyperbole in the tabloid press has consequences. This entry was posted in Damsons and tagged daily star, Philip Ste De Croix on February 24, 2017 by Michael Marshall.